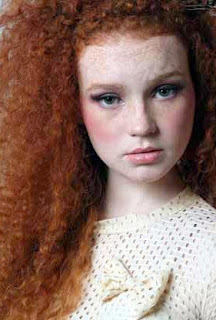 I have a client with natural red hair. She is about a level 6 R/O in the back anda level 7/8 O/R on top. She wants heavy highlighted blonde without usingenlightener. A little warmth is ok, but doesn't want to be a redhead anymore asit is not flattering on her. She also has a very tight curl with frizzy ends.Any suggestions? First thing is - Why does she not want you to use Enlightener? In my experience this is the best non-debilitating lightening (bleach) product on the market, I will assume it’s because of her tight curl frizzy ends combo. One very strong suggestion I have before I go into hair color is for you to recommend her to get the New Smooth Infusion Treatment which would do wonders for her type to just losen up the curly a bit and make any color you both choose to do look great. Now for hair color if you are 100% sure you cannot use the enlightener then what I suggest is trying the Crème Booster alone with viscosity and 40 volume, this will give you a golden /strawberry tone but I cannot guarantee it becauseI have seen it work on natural red hair color and I have also seen it do hardly anything. The best way to handle this is you can add a touch of enlightener to the Crème Booster so 2 parts Crème booster + ¼part enlightener not the other way around with 40 volume in the back and 30volume on the top and front using slicing instead of weaves for your foil work. This truly is the only way, I also feel very strong about hairdressers having the confidence and assertiveness that we need with clients that limit us with the product/tools we need to use to get the job done, why does she need to know that you are going to use a touch of the Enlightener in your Booster formula . The objective is to try and get her from what I understand as light as possible and the bottom line is nothing else will really work so go for it and tell her it’s a blonding cream that lightens hair like a bleach but is much more gentle to the hair. I do not make it a habit in lying to clients (guests) but a little white one now and again in a situation like this knowing that it will work always gets the job done for a win/win end result.